Sergio Rebelo from Northwestern University Kellogg School of Management kicked off the program in incredible fashion discussing the U.S. and the global economy. Key takeaway: Computerization and automation continue to move forward at an accelerated rate, depressing unskilled-worker wages, increasing the income gap and decreasing the breadth of the middle class and the middle market for retail and service consumption. We are headed to a recession, but the timing is indefinite. David Humphrey from Railinc provided an update on the national fleet statistics for the North American railcar fleet. Key takeaway: The national fleet increased slightly, driven by expansion in covered hoppers, tank railcars and intermodal increases. Quantities of manufactured railcars in post-recession years usually contract. Looking for a fleet requiring replacement due to age related retirements: older grain hoppers, boxcars and mill gons are your best bet. Robert Pickel from National Steel Car provided a manufacturer’s overview of the market, painting a picture of a tough market even following a relatively strong build year for railcars. Key takeaway: Tank car demand highlights a projected 51,000-unit build year for railcars. Steel prices are rising as a result of demand, tariffs, and increasing raw materials. Builders are also contending with labor cost issues. One factor to watch: the impact of PSR on car demand overall. Philip Baggaley and Betsy Snyder from S&P Global Ratings discussed the U.S. economy and the impact of tariffs. Key takeaway: S&P forecasting does not suggest a recession in the short term, but leading indicators may be softening in this consumer spending led period of expansion. Railroad credit strength remains strong with ample liquidity and capital strength to weather any downturn. Mike O’Malley from the Railway Supply Institute discussed the new car delivery picture for 2018 with a focus on tanks hauling crude and ethanol. Key takeaway: ~ 51,000 railcars were built in 2018 with the majority being tank railcars. In 4Q2018, OEMs built 565 DOT 117J or 120J tank railcars per month. 2018 was also a big year for the retrofitting of non-compliant tank railcars to a DOT 117R design. Dan Penovich from Mitsui Rail Capital waded into the tank railcar market for an update on the most active car type in North American rail. Key takeaway: Tank railcar orders outpaced deliveries in 2018, but the addition of new manufacturing capacity may slow the market down if orders for new rail tank cars don’t continue apace. Years of energy related volatility may give way to a more balanced 2019. Nicole Leonard from S&P Global Platts discussed the energy market and its impact on rail. Key takeaway: Crude prices will rise slightly in 2019 and production will continue to expand, especially in the Permian Basin. The Permian will add significant pipeline capacity. CBR demand in Canada continues with strength at least into 2020 depending on the pace of pipeline expansion. CBR volumes in 2019 expected to stay level from 2018. Eric Starks from FTR Associates discussed the current manufacturing and trucking environment and looked at how changes in NAFTA may be impacting North American rail freight. Key Takeaway: Businesses may be putting the brakes on capital goods orders and building inventory, haviwithng an impact on rail loadings. NAFTA-related freight rail freight moves are not showing severe impact from NAFTA-related changes in trade policy. Matt Elkott from Cowen & Company discussed a view from The Street on the railroads and the state of the rail equipment industry. Key takeaway: Leasing railcars seems to provide a hedge against the volatility of railcar manufacturing, so expect continued interest and competition in the space. As PSR grows railroad revenue and optimizes network capacity, the railroads will need to decide what will define them. It could be income generation; it could be technology. Kristine Kubacki from Mizuho Securities USA discussed the truck cycle, what that means for rail and where rail may be headed. Key Takeaway: Rail is still looking for the next great business opportunity (post CBR). PSR may spell the end of the current equipment cycle and investors are being cautious. Strength in trucking continues through 2019. Rod Case from Oliver Wyman discussed the need for rail to embrace technology beyond driverless trains, for improving efficiency in rail handling and in system metrics for rail to deliver on PSR promises and to improve competitiveness against technological threats from trucking being implemented today and in the future. Key takeaway: On average, a railcar (in manifest service) sits idle for 23 hours in a switch yard before being routed to its destination. Rail must embrace innovation within its existing vertically integrated network to make the necessary improvements to remain competitive. Ron Sucik from RSE Consulting discussed the current state of the market for intermodal traffic and what the intermodal market may look like in 2019. Key Takeaway: Contrary to expectations, rail was unable to capture intermodal market share from truck in 2018. 2019 intermodal growth is likely to be around 3% (less than in 2018). Congestion at the port of Los Angeles is likely to decrease in 2Q2019. Ryan Eckert from The David J. Joseph Company discussed the steel and scrap markets and what those might look like in 2019. Key takeaway: The U.S. mill run rate is above 80% (the original stated goal of the government tariff program) and additional mill capacity is being added in 2019. However, steel imports decreased only 1% in 2018. U.S. scrap exports may begin to get competition from China by 2025. The potential for trade-driven headwinds in the U.S. market remain present in 2019. Adam Simeon From the Union Pacific Railroad discussed the equipment market for cars moving steel. Key takeaway: Continuing economic trends of a strong dollar and low-priced crude will have a slightly negative impact on cars hauling scrap and a stronger impact on cars hauling plate steel. UP sees industrial production growth declining in 2019 and 2020, and this is further likely to impact these markets. Joe Devoe from DVB Bank SE discussed the lending market for railcars and what happened in that space in 2018. Key takeaway: While there were only two ABS transactions in 2018, railcar spreads continue to show strength trading on a more-narrow basis than other markets such as containers. Lease rates on new cars continue to decrease, putting stress on the amount of money that can be lent against assets. Stefan Loeb of Watco Companies discussed the boxcar market from the short line side. 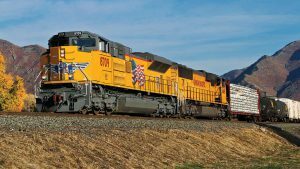 Watco sees growth in this market segment as the fleet ages and makes adjustments associated with PSR. Key takeaway: The national fleet of 50-foot boxcars continues to fall short in serving the needs of all boxcar users in North America. A short line-owned boxcar pool to serve customers with additional needs beyond the national pool might stand to benefit an industry dealing with an aging fleet. Bruce Ridley from Packaging Corporation of America discussed the shipper perspective on the boxcar market. Key takeaway: Shippers are price-sensitive. A shrinking boxcar fleet causes modal shifts on certain corridors between truck and rail. 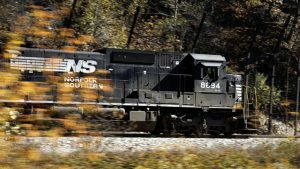 Rail does not assert itself as a price leader to command shipper boxcar traffic. Shippers work to find reverse route loads to avoid the total supply chain drag associated with empty car moves. It’s opportunistic, but beneficial when it works. Paul Titterton from GATX Corporation discussed the boxcar market from the perspective of a lessor and owner who has the opportunity to participate in the market on all sides. Key takeaway: The national boxcar fleet is set to decline by 7% over the next three years. To stem the tide and promote investment, the following needs to happen: The default rate (car-hire) system needs reform, other parties (e.g. short line railroads) beyond TTX and Class I’s need to be involved in the running the national boxcar fleet, and the types of boxcars in service needs to adapt to the customer base rather than forcing the customer base to adapt to the kind of boxcars being offered for service. Bill McNally from Oklahoma Gas and Electric Company addressed the coal car market and what has been happening in that segment. Key Takeaway: Coal burning will continue to decline, but weather and the scrapping of cars that have been or are headed out of service will impact car demand. Lessors hoping to keep cars running and in service need to be flexible with their customers. The energy market is impacting both parties, and everyone needs to remain aware of those changes and their impact. Michael Weiss from Greenbriar Equity Group provided a perspective on the rail marketplace from the private equity investment world. Key Takeaway: In the PSR world, rail customers are looking for lower prices, better asset utilization and a better rail network. This is something that has been pretty consistent for the past ten years and will likely also be the case for the next ten. Railcar Valuation Panel (Ed Biggs from Biggs Appraisal Service, Sean Hankinson from The Andersons, Pat Mazzanti from Railroad Appraisal Associates, and Greg Schmid from Residco) handled the difficult issue of what used car values will look like in 2019. Key Takeaway: Values on newer cars trading in the secondary market are being impacted by lower lease rates. Valuation strength exists in specialty hoppers (pressure differential hoppers) and in cars for moving plastics. There is weakness in older grain cars and older mill gondolas as those fleets trend toward their maximum ages. Anthony “Tony” Hatch from ABH Consulting talked about the cult of OR, the PSR trend in Class I ops and the health of the industry. Key Takeaway: The Class I’s continue to spend capex at a massive rate ahead of most peer industries on a percentage basis. The rails and the rail network are in “best ever” condition. Intermodal loadings are growing, which grows revenue. Class I’s in a post PSR environment, like CN, are moving aggressively to grow their franchise. 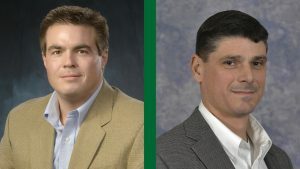 Matthew Rose from Burlington Northern Santa Fe discussed his perspective on the BNSF business outlook, PSR and the emphasis on OR with Railway Age Editor-in-Chief William C. Vantuono. Key Takeaway: BNSF is focused on customer growth while on time performance has always been a part of BNSF strategy. BNSF’s focus is on growing traffic units, not cost savings. Strong traffic growth will drive increases in revenue and service that will improve OR. (For longer and more in-depth reporting on this session, see the article by Railway Age Contributing Editor Jim Blaze. Panel on the Health and Future of the Leasing Market (Jesse Crews From Trinity Industries Leasing Company, Bob Lyons from GATX Corporation and John O’Bryan from American Railcar Industries) discussed how the current lease market is evolving and how lessors are managing in a tough lease rate environment. Key Takeaway: Lessors feel that service in the leasing market is a place where lessors need to focus attention to show customers that there is more than price in the equation of leasing railcars. Lessors are concerned by over-building and lease rates that do not support the cost of new railcars. Lessors see a difference between more general freight cars and more specialty cars. Lessors remain cautious about the market but are happy with the strength they see today. Graham Brisben from PLG Consulting discussed the sand, chemicals and plastics market for rail. Key Takeaway: Sand loadings were higher than the 2014 peak through March 2018, but declined thereafter due to market penetration of local brown sand. This is having a negative impact on the small-cube covered hopper fleet. Mexico continues to be a strong consumer of U.S. refined products. That is expected to continue in the near future. 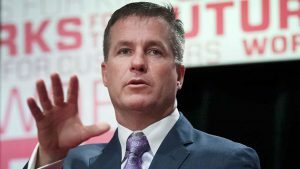 Graham anticipates that increasing plastics expansion will create the need for an additional 9,000 plastics hoppers and 6,500 tank railcars in 2019 and 2020. Todd Kahn from Chicago Freight Car Leasing closed out the North American Railcar Review in his discussion of the market for all types of covered hopper railcars. Key Takeaway: Covered hopper railcar deliveries exceeded 20,000 per year for the fifth straight year in spite of the shrinking demand for sand hoppers and for grain hoppers. Although grain shipments have increased car supply has outpaced that demand. Plastics hoppers and pressure differential hoppers remain the bright spots in this market segment. David Humphrey from Railinc provided Railinc’s update on the national fleet statistics for the North American locomotive fleet. Key Takeaway: A low build year left many fleet dynamics (age, quantity, diversity) very stable over the past 12 months. As expected, the big trend is the conversion from DC to AC as existing locomotives are rebuilt for longer service lives. Don Graab from Triangle Brothers and Associates provided his perspective on the North American Locomotive Market and the health of the industry overall. Key Takeaway: Locomotive rebuilding continues to take center stage for railroads in addressing their locomotive needs. 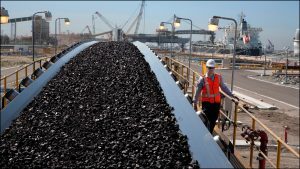 For 2019, locomotive demand should decline as Class I’s continue to implement PSR and look for alternative fuel sources. Allen Meek from Cummins Inc. gave an update on his company’s activity in the current locomotive marketplace. Key Takeaway: Cummins continues to expand its Tier IV EPA-compliant offerings, including the QSK95 engine that is in service in a variety of passenger routes in North America. Cummins continues to expand its offerings for the freight market as well. Tom Chenoweth from NRE discussed the current state of EPA requirements for locomotives and what those standards mean in applications for users and owners of equipment. Key Takeaway: Class I’s prefer to rebuild most locomotives without aftertreatment while working to maintain fuel economy. Remanufacturing can address many of those issues. Tier 5 continues to have potential as a real emissions requirement. A 2:1 remanufacturing program may be required to meet those requirements if (when) they are put in place. Stuart Biggs from Biggs Appraisal Service discussed the new locomotive market and adjustments to certain unit models in 2018. Key Takeaway: Approximately 250 new locomotives were built in 2018. The trend in rebuilding is expected to continue over a period of many years. The GE/Wabtec merger may offer some new opportunities on the rebuilding front. David Scott of CNGmotive updated the picture for using compressed natural gas (CNG) as alternative fuel for locomotives. Key Takeaway: CNG remains the low cost fuel alternative for North American railroads. CNGmotive is in the process of building its first crashworthiness-approved tender and is expecting to test it in the third quarter of 2019. 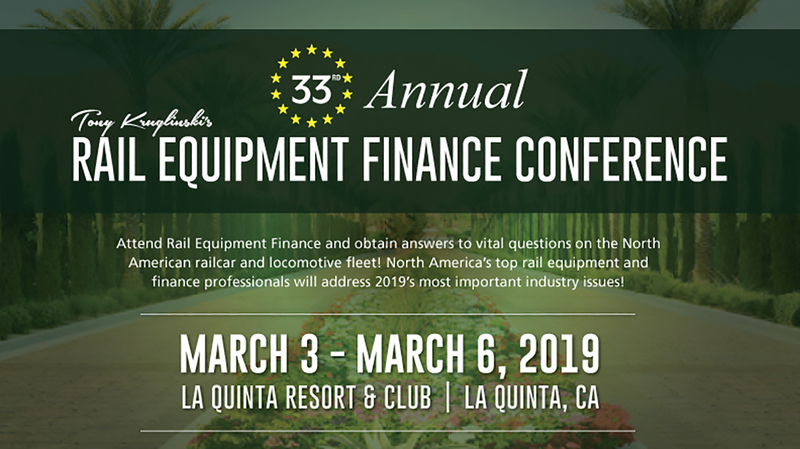 Jason Kuehn of Oliver Wyman discussed the aging locomotive fleet in North America and some steps needed by the railroad industry to address these problems. Key Takeaway: PSR might mean the death of the DC powered locomotive. BNSF and GE are pursing battery-powered locomotives, but many questions remain on that front. Six-axle lease rates are likely to decline. There are some new ideas in freight locomotives such as platooning trains or using four-axle electric booster engines. On the passenger side, demand is on the rise, with Siemens fulfilling much of the demand. Locomotive Valuation Panel (Steven Beal from NRE, Pat Mazzanti from Railroad Appraisal Associates and Greg Schmid from Residco) discussed the current marketplace for used locomotive power and addressed issues in the rental market. Key Takeaway: For the most part, used locomotives have retained their value with modest declines in price increases across all models. The rental market continues to be under stress as PSR creates excess capacity in the six-axle fleet and as the industrial market does not have the volume needs to stress capacity in smaller horsepower four-axle units. REF 2019 was an awesome event with excellent speakers and content. Plan to attend REF 2020. Go to www.railequipmentfinance.com.